An API 653 Tank Inspection is the petroleum storage industry and DoD process to determine tank hydraulic and structural integrity. Inspections are performed in accordance with the applicable portions of API Standard 653, UFC 3-460-01, and UFC 3-460-03. Out of Service inspections include visual inspection of the tank floor, shell, and roof, and pit survey for topside corrosion on the floor plates. 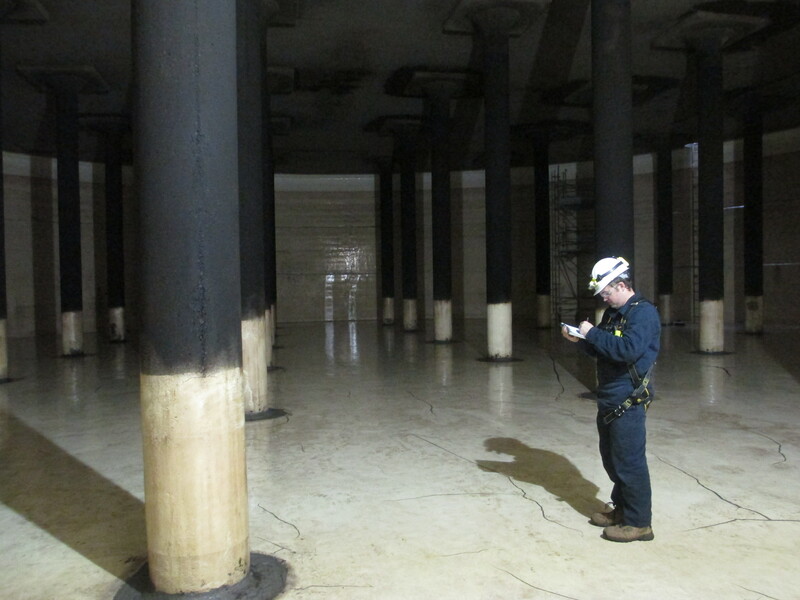 The inspections also include the following non-destructive examination procedures: magnetic flux leakage (MFL) scan of the floor for bottom side corrosion, and ultrasonic inspections of the floor, shell, and roof. In accordance with DoD requirements, EEI also evaluates appurtenances and the secondary containment system and the piping up to the containment wall. EEI typically self performs tank inspections; in a typical year our engineers, many of whom are also API 653 Certified Inspectors, will inspect more than 100 tanks worldwide. This recent project included API 653 Out of Service inspections of two tanks and an API 653 In-Service inspections of three tanks at Eielson AFB in Alaska.